You’re not the only one wondering if you can find keto foods, including keto snacks and keto drinks, at Dollar General. 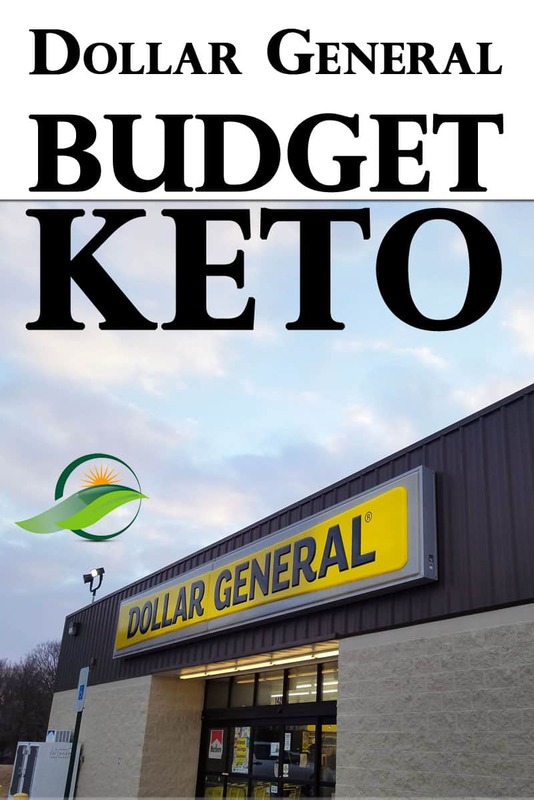 I had the same questions, so I went to a rural middle-America Dollar General Store searching for keto food options and here’s what I learned. You can find keto food at a Dollar General store! Not only did I find keto snacks at Dollar General, I found staple foods that you could use to eat keto on a budget, even in a rural small town where your only option is shopping at Dollar General. During my time at Dollar General, I took pictures of the keto-friendly food that I found and I’m sharing some of those pictures with a list of what I found. 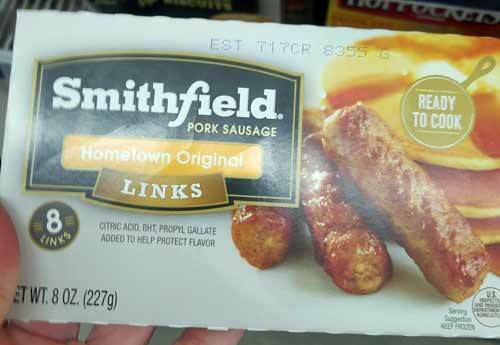 1 – Smithfield Hometown Original Sausage Links – A keto-friendly, ready to cook sausage in the freezer section at this Dollar General. Just 1 Carb in 3 cooked sausage links! Be careful when buying sausage, though, and look at the label. They also had another flavor of Smithfield Sausage which was much higher carb. 2 – Beef Steaks – Sure, these are tiny little steaks, but steaks nonetheless. They even had two choices of steaks, right there in the freezer! 3 – Cooked Shrimp – Unless you’re allergic to shellfish, you should probably be eating it more often. Packed with nutrients hard to find anywhere else. But you can find this keto shellfish treat in the freezer section at this Dollar General! 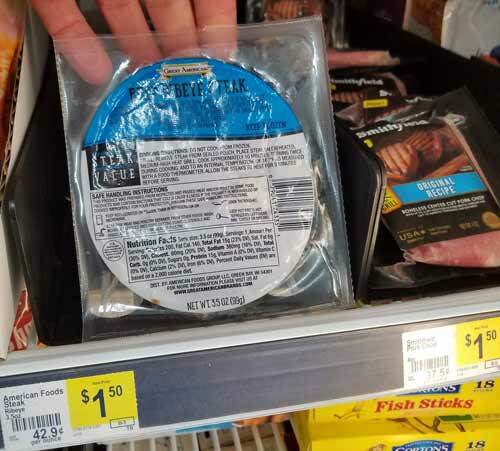 4 – Ground Beef – This Dollar General Store had frozen ground beef in tubes and patties, both ready to go home for your keto supper. 5 – Chicken Breast Strips – Cooked and frozen chicken breast strips make meal prep easy and can help you keto on a budget. ProTip – These work great with our No Cook Keto Meal Plan – The Easiest Way to Start Keto. 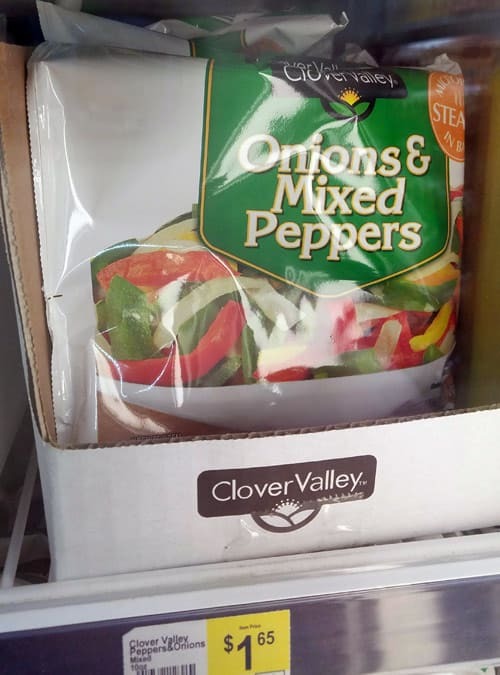 6 – Frozen Onions & Mixed Peppers – Be careful how much of the onions you’re eating as they can add up to sneaky carbs, but this mix can easily be added to the Chicken Strips or Ground Beef we found at Dollar General to make a great and easy budget keto meal. 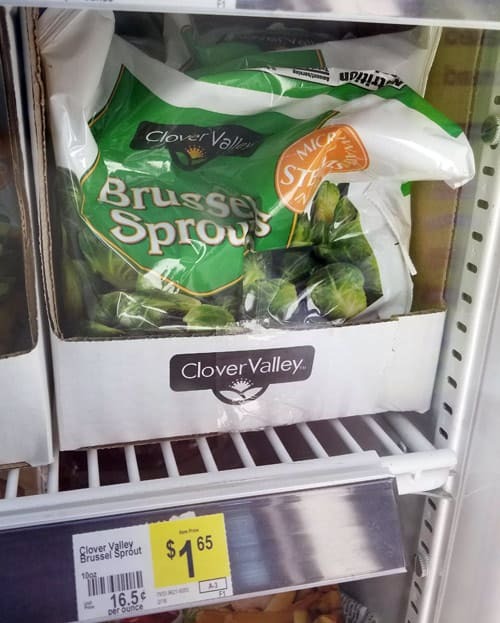 7 – Frozen Brussels Sprouts – The carbs in this nutritious vegetable can add up, but in our house we honestly don’t count the carbs in Brussels sprouts. After years of being fat adapted, we value all that great fiber and nutrients more that we sweat a few carbs. If you are just starting keto, just watch your portion size and keep track of the carbs. 8 – Frozen Broccoli Cuts – Broccoli is a Keto Diet staple. As a matter of fact, it might be the most popular keto-friendly vegetable. 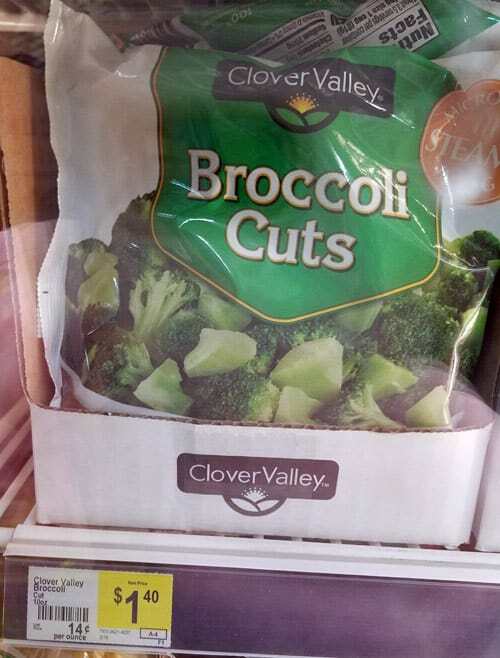 You can steam broccoli and add it to some warmed up some chicken strips, add butter to both, and you have a complete and affordable keto meal from Dollar General that’s perfect for someone just starting a keto diet. 9 – String Cheese – A staple keto snack that is probably available in every Dollar General store and, as a bonus, it’s kid approved. 10 – Pepperoni – This is a great high fat low carb snack! 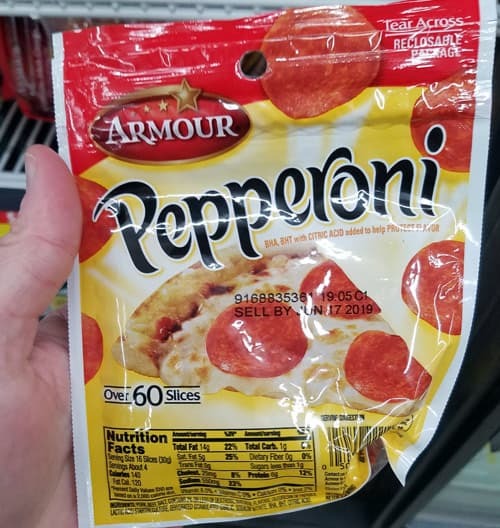 Now, to be clear, this isn’t the highest quality pepperoni. Its ingredient list is packed with preservatives, which for me would place it solidly in the dirty keto category. Sometimes you do what you’ve gotta do, though, and dirty keto is better than no keto! 11 – Various Deli Meats – Just check the nutrition label before you buy because some deli meats do have added sugar (watch the ham closely). Wrap some deli meat around one of those string cheese sticks and you have an on-the-go keto sandwich! 12 – Heavy Cream – A great, nearly zero carb source of fat that also happens to be yummy. Add it to your coffee or make a cream sauce for your chicken and broccoli. 13 – Almond Milk – In full disclosure, in our keto house, we don’t drink almond milk, but a lot of the folks we help start keto do use it as a low carb alternative to cow’s milk. Just in case you don’t know, while heavy cream is nearly zero carb, cow’s milk is not. The natural sugars in cow’s milk add up fast. 14 – Cream Cheese – 1 Net Carb Cream Cheese is a staple for a keto beginner. Use it as a base for dips, spread for wraps, or add it to heavy cream to thicken your cream sauce fast and easy. 15 – Various Cheeses – Cheese is a great source of fat and protein. Some on a very strict keto diet avoid the shredded cheese because it often has starch tossed with the cheese to keep it from sticking together. We don’t worry about it in our house, but if you’re just starting keto, you might want to think about it. 16 – Bacon – Mmmmm, bacon. IMHO, everything’s better with bacon. 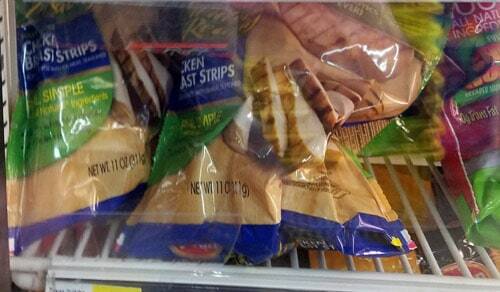 This Dollar General store had both raw and precooked bacon. If I had time, I’d choose to cook my own bacon, but in a pinch, precooked bacon is better than no bacon. 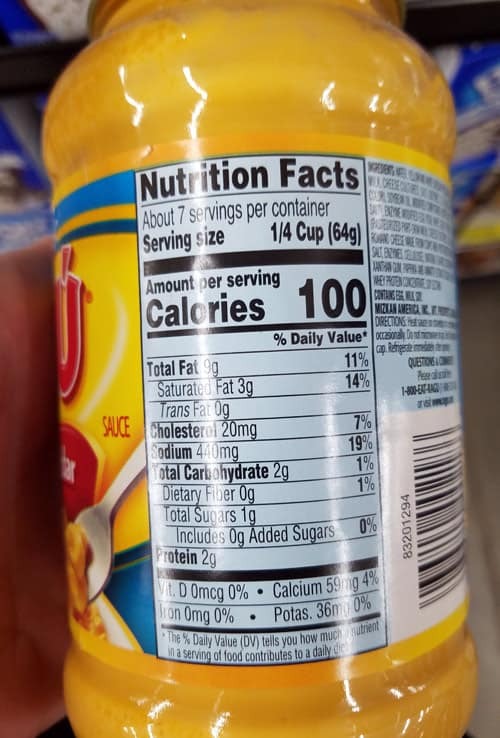 Once again, look at the nutrition label, as some flavors contain sugar. 17 – Ham Steaks – Ham steaks make great keto food. Most are precooked, so you could eat them straight out of the wrapper, or microwave them to warm them up. Or if you have time fry them quickly in some butter. That’s my favorite. 18 – Eggs – Eggs are an absolute staple of a budget keto diet. Eat them anyway you like, but enjoy the affordable fat and protein. ProTip – Eggs can make a Budget Keto Diet be so much more affordable. Check out our Keto Potato Salad Recipe which is great for summer picnics or just as a make ahead keto meal prep. 19 – Hot Dogs – Another budget friendly keto food. Watch the nutrition label to make sure there’s no added sugar, but otherwise enjoy! 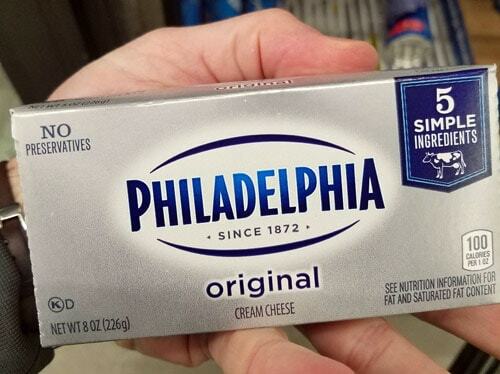 20 – Butter – This Dollar General had a number of butter choices, but look for the real butter. You don’t want margarine or anything like it because it’s made with processed seed oils instead of healthy, natural fat. 21 – Slim Jims – It pains me a little to suggest Slim Jims on a Keto Diet, but they really aren’t terrible. These small Slim Jims are just 1 carb for the small sticks, but they are packed with fillers and preservatives. They wouldn’t be my first choice, but dirty keto can still get the job done. 22 – Nuts – Nuts are a great source of fat, but many of them are surprisingly high in carbs. Sadly, most are also roasted in seed oils that many people, including me, find very inflammatory. (They make my arthritis flare up.) Check the labels, choose wisely, and remember that a snack of nuts is a small handful, not a bag full. If I can find raw almonds, that’s often my choice for a crunchy snack on the road. 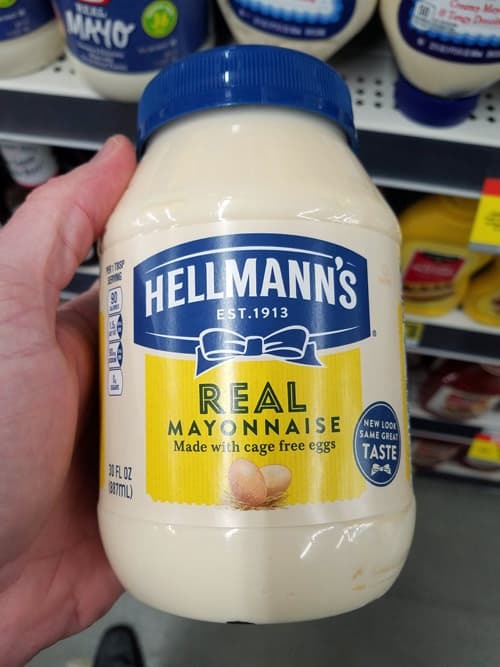 23 – Real Mayonnaise – Real mayo is zero carb and a good source of fat. Conventional mayo is not ideal because it’s made primarily from seed oils, but if it’s what keeps you out of the SAD (Standard American Diet) and in ketosis, do it. Avoid Miracle Whip, as it shares the downside of seed oils and also has added sugar. ProTip – If some high quality foods will fit in your budget, one of the places to start might be Primal Mayo which is made with Avocado Oil. 24 – Bacon Bits – Good source of fat and protein, but with the downside of preservatives. I’d prefer to cook my own bacon, but these aren’t a bad fall back plan. 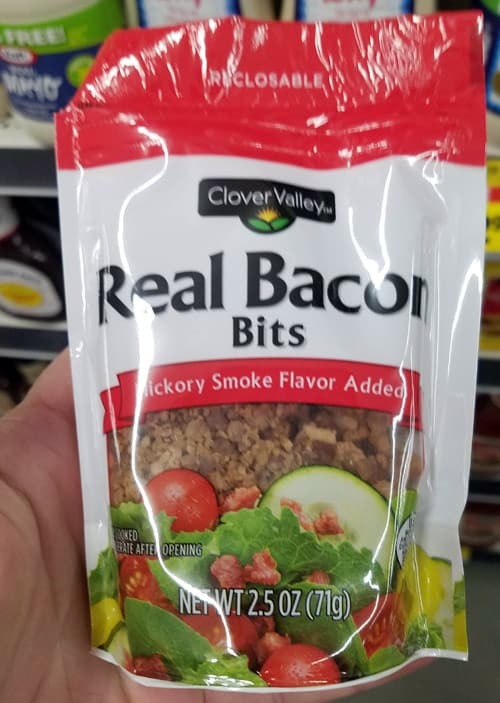 Eat bacon bits on salad, add them to cooking ground beef to add flavor and fat, or just eat them as a keto snack. 25 – Olives – A great source of plant-based keto fat. Choose the black or the green olives. Eat them as keto snacks or add them to ground beef or a stir fry to jazz up your meals. Olives are not zero carb, so pay attention to how many you’re eating. 26 – Pickles – Decent quality dill pickles (not sweet pickles) are a keto staple with just 1 carb per serving. The electrolytes in the juice also help some people avoid the symptoms of keto flu. Just watch the nutrition label, because carb counts vary by brand and flavor. 27 – Coffee – If you’re a coffee drinker, it’s just fine on a Keto Diet and has some beneficial effects on hunger when you are first introducing Intermittent Fasting with your Keto Diet. Drinking Fatty Coffee is a very common practice with those who eat keto. Watch for carbs in the flavored coffees, but otherwise, enjoy! 28 – Mustard – Most condiments are packed full of sugar, and therefore are not appropriate for a keto diet. Mustard is one of the exceptions. It’s zero carb and full of flavor. 29 – Hot Sauce – Most hot sauces are zero carb, but check the label. 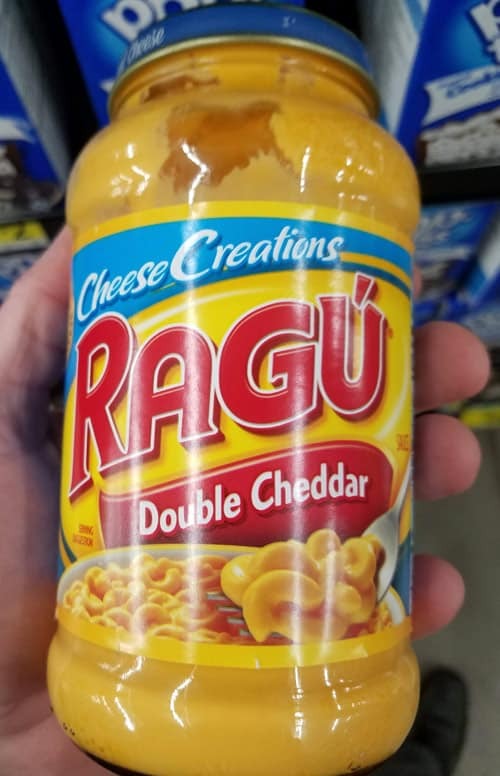 This is a super easy way to add some diversity to your Dollar General Keto Meals, as well as a punch of heat! Pro-Tip – Like the heat? Then try our Keto Hot Wings Recipe! 30 – Salsa – Most salsas don’t have added sugar, but always check the label. I eat salsa on many of my meals. I love the flavor and heat, and usually two tablespoons of salsa only adds about 2 carbs. Pro-Tip – If you make a batch of Easy Pulled Pork, you can eat it all week with Cheese and Salsa to get your Mexican Food fix. 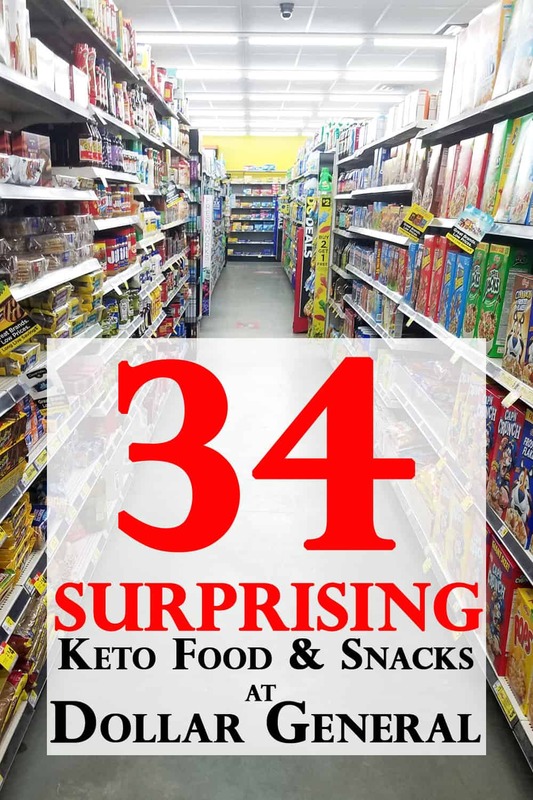 31 – Cheese Sauces – Processed cheese is pretty dirty keto, but these sauces can really help add variety to your Dollar General keto choices. Put these cheese sauces on your broccoli, chicken, beef…heck, put it on anything low carb to create a fast, easy, and cheap keto meal. Notice that I didn’t include the Marinara style sauces that are found on the shelves with these cheese sauces. Nearly all of those contain sugars, so be careful. 32 – Coconut Oil – This is a great plant-based keto fat. Great to cook with, and a staple ingredient in many fat bombs. Every keto kitchen should have coconut oil in the pantry. 33 – Olive Oil – One of the three most popular dietary fats in a keto diet, along with butter and coconut oil. A keto staple for salads, vegetables and cooking. 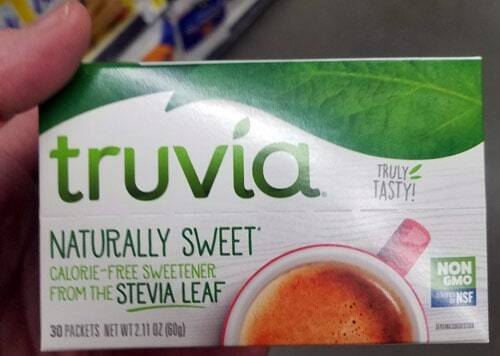 34 Truvia Sweetener – This Dollar General had three keto-friendly sweeteners to choose from, including Truvia. Use them in your coffee, tea or fat bombs. Keto Shopping at Dollar General – The Conclusion. Honestly, I was a bit shocked at how many budget keto foods and snacks I found at this small town Dollar General Store. This Dollar General is in a town with no real grocery store and my expectations were pretty low. Not only did I find way more low carb foods then I expected, they were cheap. 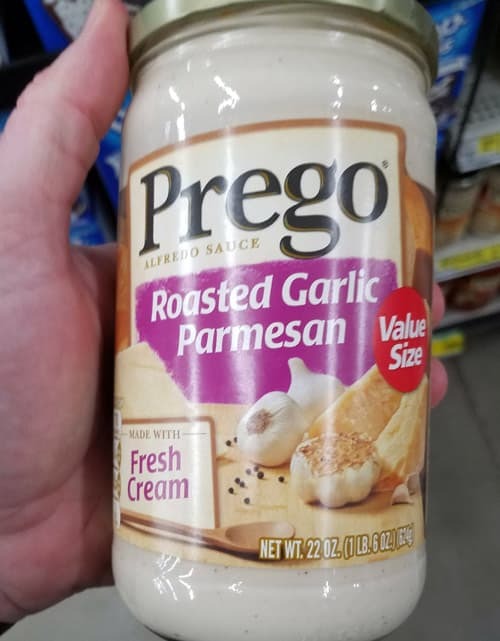 Sure, eating keto at a Dollar General store isn’t as cheap as eating pasta from the same store…until you add in the cost of your diabetic medications. After this trip to Dollar General, I 100% absolutely believe that you can eat keto when shopping for groceries at a Dollar General store. You got this. Now’s the time to get your Keto on! No excuses! Are you starting your Keto Diet? 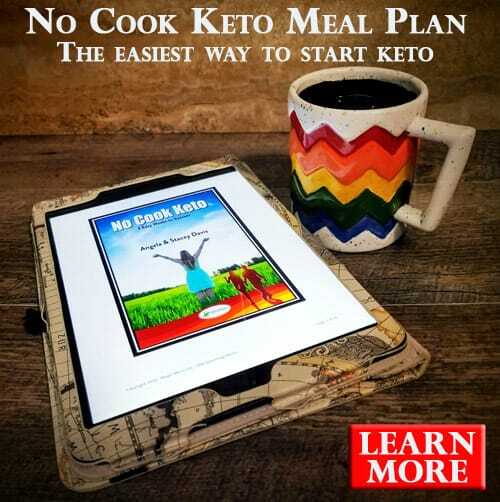 Check out my No Cook Keto Meal Plan. It’s the easiest way to start Keto. Wow! Excellent resources Angela, wish we had a Dollar General in Ontario Canada but I will do some research in the Dollarama or Dollar Tree we have here and post some comments on my finds. Glad you found this article valuable and thank you for the kind comment. Please do let us know what you find in your local discount stores. 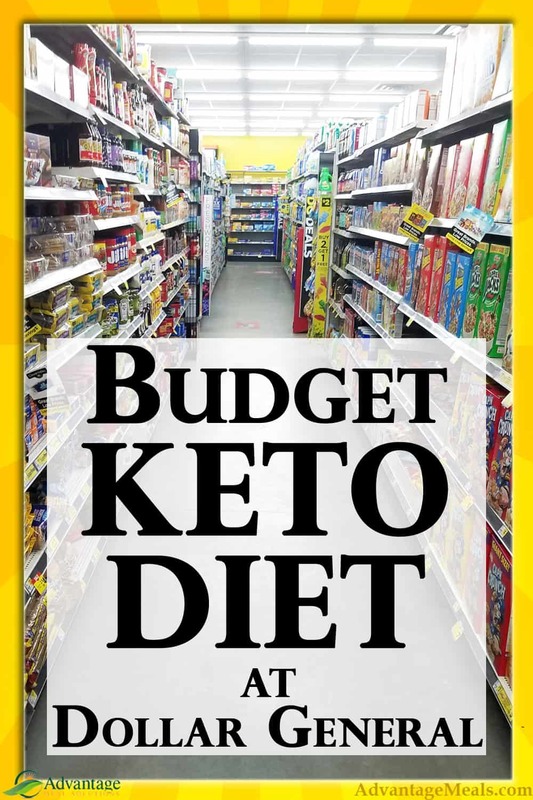 We’re so curious if you can find a similar selection of budget keto foods there. I tried to do my Paleo shopping trip at Dollar Tree when I was really broke. I remember I got some olives, pork rinds, canned veggies, and eggs. Biggest problem was fresh meat. All I found was chicken in a bag but it was too freezer burned. But if you aren’t strictly Paleo these are some options! Yeah, it’s not the highest quality food, but it’s a step in the right direction for many people. As Angela says, Dirty Keto is better then no Keto…or Kinda Primal is better then No Primal. Hi I’ve not long started the 16/8 intermittent fasting diet and keto diet.and have been roughly doing it for about 6to8weeks.and I find it’s really good in fact I find it’s absolutely brilliant. Just fabulous I think is brilliant.and can’t imagine not following this way of eating now as it is realitively easy in some areas but there are areas where I’m still learning about.and am as I’m still going through the motions of finding and knowing what I can and can’t have on the keto diet and what you can drink and in what quantities per day.and make sure that I’m not consuming sugar in any way shape or form as I’m just loving this way of eating now as it’s just great. Agreed! Dollar General is much more Dirty Keto than Paleo. Sometimes we do what we have to do, and that’s ok! How very thoughtful of you to take your time to publish these results you found at Dollar General. What very helpful information. I sincerely appreciate your efforts. Such a nice note. We’re so glad you found this valuable. Thank you. This is so awesome! thanks so much for these tips. Our pleasure. Thanks for the kind note. Keto on!